Cowboys and Aliens is a new video pokie that has just been released from Playtech. Playtech has been working hard over the past year to design and release new games to its portfolio of games. Cowboys and Aliens is classic 5 reel, 9 line video slot that offers up the best of yesterday and combined it with the newest features slot games offer. The theme of this slot is based around the old west and how the cowboys and Indians used to battle it out only they add a twist and use Aliens versus Indians. The pokie takes on a comic book appearance on the reels in the way the symbols have been created and displayed. Those symbols you will see include gun toting cowboy, Indian warrior, a really ugly alien, cowgirl, alien spaceship, ray-gun, a bespectacled preacher man and some bonus symbols. The Cowboys and Aliens logo is the bonus symbol and the alien spaceship acts as the wild in Cowboys and Aliens. The ray-gun is also a bonus symbol as it will trigger the Alien Weapon Feature. 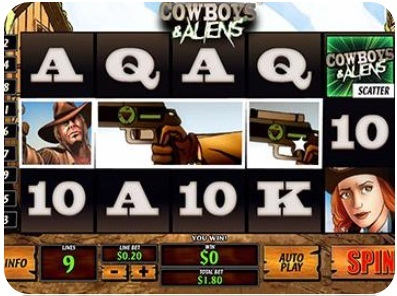 As with all new pokies that are being created today Playtech have put together a few features in Cowboys and Aliens. Those include free spins, which are awarded when 3 of the Cowboys and Aliens logo appears anywhere on the reels. This will give 8 free spins and will include the comic book wilds. The Comic Book wild is won only during free spins when a rectangle is found on the reels. All symbols within the rectangle will turn wild and complete any possible win combinations. There are also a ray-gun bonus feature and a bonus game. The ray-gun is won when a ray-gun symbol lands on reel 1. It will cause the ray-gun to shoot up to 4 times and each time it will turn one position on the reels wild. The bonus game though is the real excitement as it will allow you to choose one of three characters to fight the aliens. If you choose the right one you will kill the alien and be awarded with a hefty cash prize! Cowboys and Aliens can be played at any of the Playtech casinos you see promoted on this website. One of these great casinos is Vegas Red Casino. Are you looking for a new casino to try out the new Playtech pokie, then Vegas Red Casino could be a fabolous choice if you do not already have an account there. Visit by clicking one of the links here on this page, above or below this article. You can get a free $888 match bonus when you make your first deposits. They have some great ongoing promotions and they always add the new pokies first. Do your self a favor and try the new pokie for free the first time you try it. It always a good idea to try a new pokie in “fun mode” before playing with your own money. Good luck!